Yes, it’s winter. Yes, we’re tired of of being cold. Simple rituals, like reading the morning paper, which is full of doom and gloom, need to be replaced with more nurturing ones. My 7th grader is facing one of his toughest academic weeks yet, my first grader is suffering from penmanship burnout, (yes, this does appear to be his best work). My husband is traveling and dining out more than ever with clients, and there’s no partner adult in site to get me through the witching hours. The thread between after school and the morning alarm is somehow frighteningly shorter than I can ever remember. We’re staying up way too late trying to get caught up. And, I just remembered, we must count out 100 pieces of food to bring to school for the 100th day of school snack they will share. Every time I think about first and second grade fingers counting out pretzels and cheerios, to toss into a bowl for everyone to eat, I kind of recoil. I’m thinking of all of those strep throat notices that come home in a continuous cycle from class to class, not to mention the stories about so-and-so who tossed up (I’ll spare you from the graphic language my kids use) in the hall. More importantly, do I even have 100 of ANYTHING left in my Mother Hubbard cupboards? The kids are ravenous when they arrive through the door, tearing and depleting every box and bag we have. Despite all of our efforts to carefully count out the snacks, my son, I’m sure of it, will stick his hand in the bag and eat a portion of them on the walk to school; but hey, who’s counting? So heat up your oven, and use the frigid winter as your excuse to indulge into these oatmeal baked apples. Preheat oven to 375°. Squeeze juice from lemon halves into a large bowl with 2 cups cold water. Carve out a large “bowl,” including the core, about 2 inches in diameter, leaving the bottom of apple intact. Place carved apples in lemon water. Chop cut-away apple pieces into small chunks, removing any core or seeds. Toss with 3 tablespoons honey and cinnamon; set aside. Combine remaining honey with 1/2 cup hot water and stir until well blended. Stand apples, cut side up, in a 9″ x 9″ shallow baking dish. Place 1 teaspoon butter in bowl of each apple and pour honey and water mixture on top. Cover dish with foil and bake until tender, 25 to 35 minutes. Meanwhile, in a medium saucepan, bring 1 3/4 cups water and a pinch of salt to a boil. Add oatmeal and apple pieces, and stir until mixture returns to a boil; reduce heat and cover. Cook until tender, 7 to 10 minutes. Remove from heat. 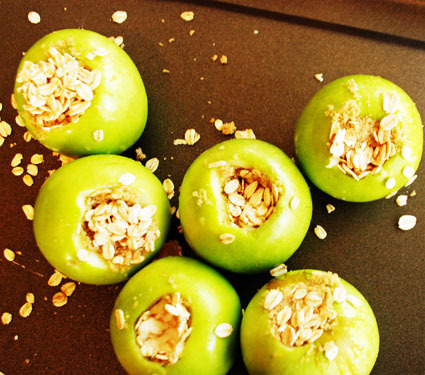 Remove apples from oven and carefully fill with oatmeal mixture. Top with brown sugar. Place under the broiler 1 minute, just until light brown sugar is bubbly and dark brown. we counted out 100 pink m&ms last week. Now that looks yummy! I’m going to try it this weekend. Thanks!